1) It bothered me that the strands stuck to each other a little. 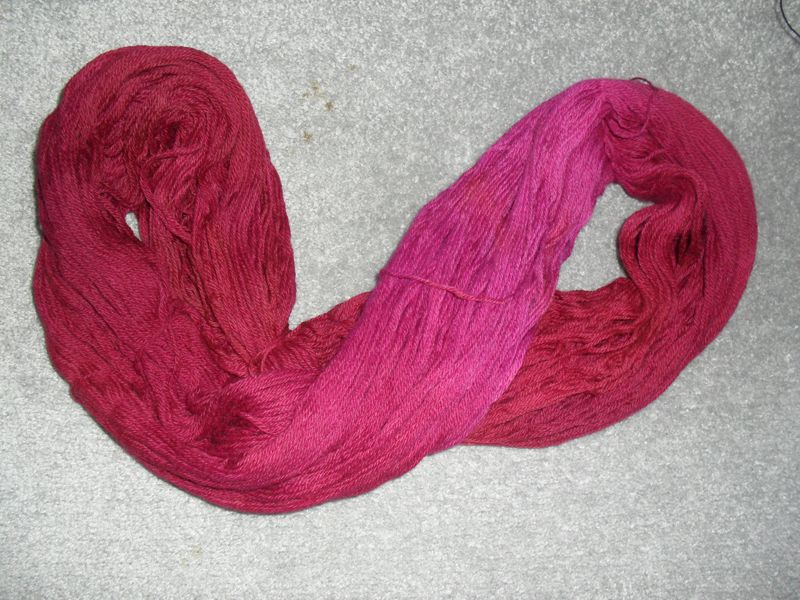 I think this is because when I rinsed them and squeezed them out, there was SO MUCH YARN some of the strands dried together. 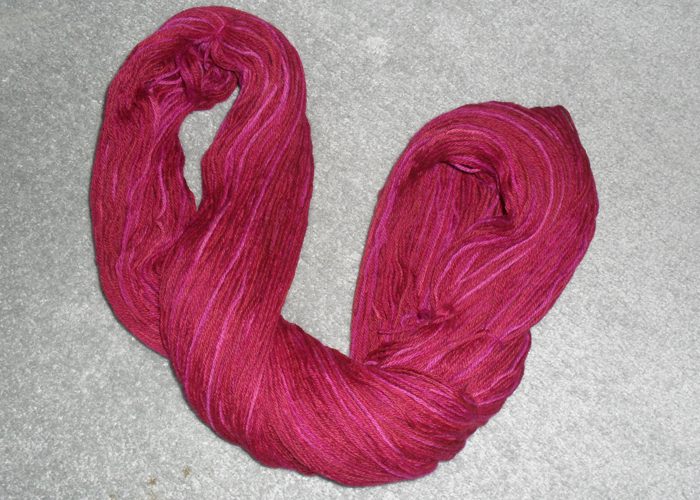 2) Reskeining gives you an idea of what the yarn will look like when you actually knit it. 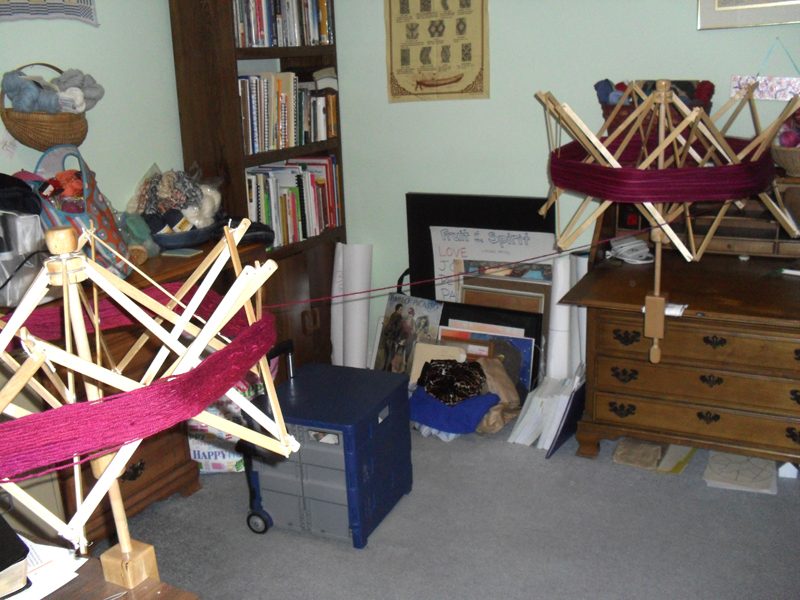 So I bought a second swift at the store where Rebecca works in Pittsburgh: “Yarns Unlimited” and set them both up in my craft room. 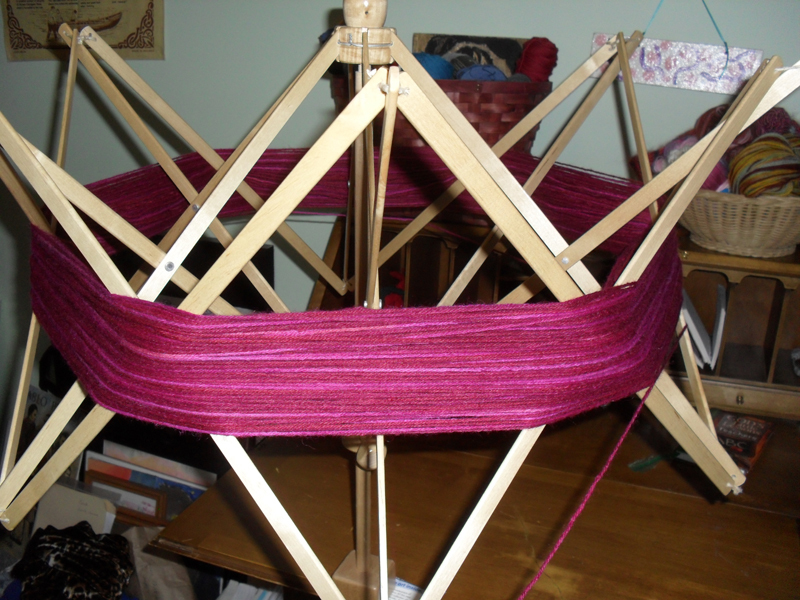 I made sure the 2nd swift was opened up to a larger diameter, so as I wound the skein from one to another, it would mix up the colors. I really, really like the way the pink-red semi-solid looks after reskeining, but I’m not sure about the multicolored one. It would depend on what I was going to knit with it…..the individual colors are more clear before reskeining, which might be important. What do you all think? i think they are both beautiful. i recently purchased a swift from Paradise Fibers that is a flat swift that stores in a bag. it is wonderful and makes it so easy to set-up and then store out of the way. 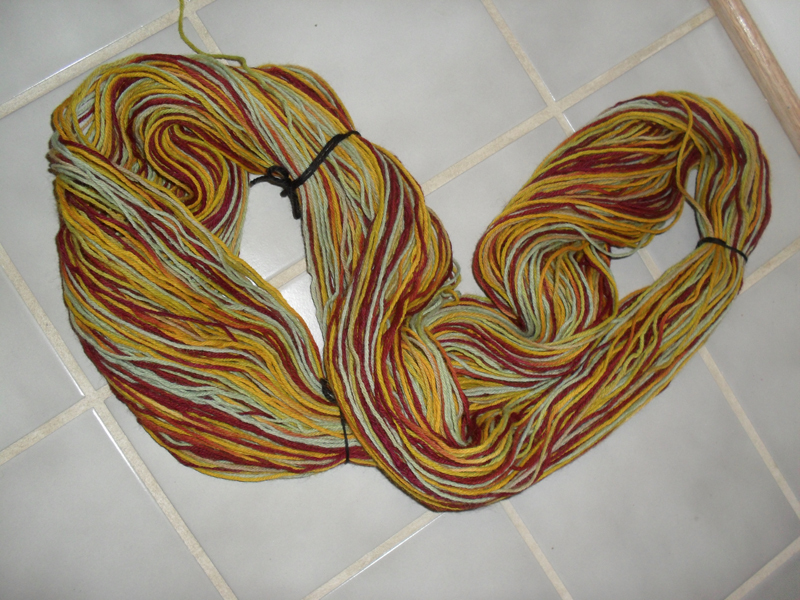 I feel very strongly as a dyer about reskeining and now you see why – if you buy a yarn that is not reskeined you may very well have NO idea what you’re going to wind up with! Colors that are distinct and separated “go together” much differently than colors that are all mixed up. First, colors get more subdued when they blend together, second, they can look pretty good separated but look like crap blended up. (or vice versa.) 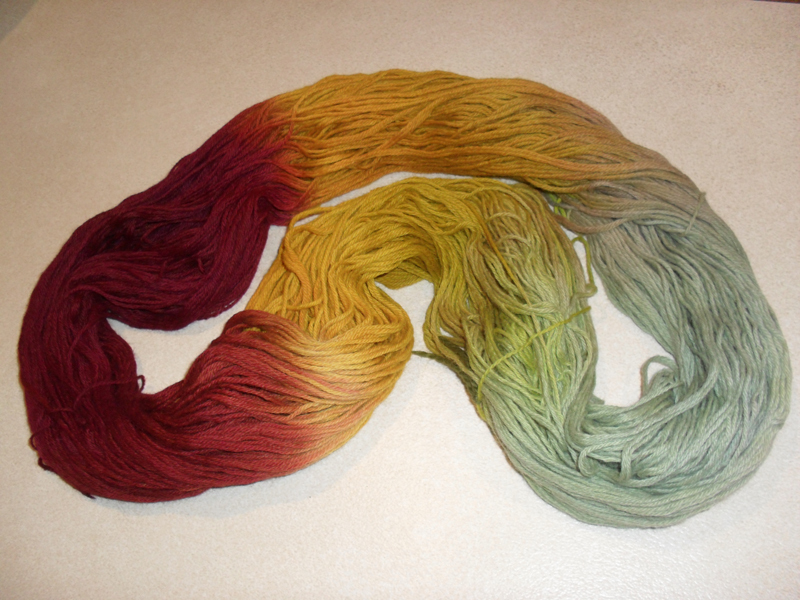 So since they will be really blended up in the knitting, it is a good idea to only buy yarn that has been reskeined. I don’t buy un-reskeined yarn unless I have checked it out carefully and am pretty confident that I will like the finished product (by things like short color repeats, easily coordinating colors, etc. And Judi, yes, swifts are the bestest! Especially those of us with houses who are limited by the space-time continuum.